Gavin Peers insists Derry City won't deviate from their normal passing game and will go to attack Sligo Rovers at the Brandywell. GAVIN PEERS has defended Derry City’s insistence on playing high risk football, claiming the team won’t sacrifice its attractive style for a more conservative approach despite recent results. The Candy Stripes have alarmingly conceded 13 goals in their last four matches going into games against Sligo Rovers tonight at Brandywell and Cork City at Turner’s Cross on Monday afternoon. The Bray game wasn’t the best but we got the result. Do you want to see that week in, week out or do you want to see games like when we absolutely battered Waterford at home? Playing it out from the back, playing with attacking flair and freedom and taking risks, have been hallmarks of Kenny Shiels’ teams over the past two-and-a-half seasons on Foyleside and Peers isn’t expecting that to change in the wake of a couple of heavy defeats. And while the experienced ex-Sligo Rovers man thrives off clean sheets as a defender, he has fully bought into Shiels insistence of playing an exciting brand of football which will inevitably leave the back four exposed. He sat out last week’s defeat to Waterford with a knee injury but with Eoin Toal (back) rated doubtful for tonight’s match, he’s expected to return to the starting line-up against the club he won the title with back in 2012. 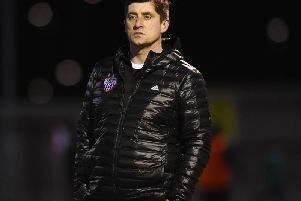 “It’s difficult because we go out to attack,” explained Peers when asked if he was concerned about recent results against Dundalk (4-0), St Pat’s (5-2) and Waterford (4-0). “We go out to play attacking football and when we do lose the ball we’re very open but that’s just part and parcel of the way we play and the way Kenny wants us to play. We are open but we create a lot of chances as well. If you’re going to go solid, you’re going to stop creating as many chances. You’ve just got to out-score the other team. “As a defender you want clean sheets but Kenny wants us to play football so you have to make angles for each other and be nice and open meaning it’s harder to keep clean sheets though nobody was saying anything about it when we were winning week in, week out,” he pointed out. Derry have actually kept an impressive eight clean sheets this season and have held, Cork, Shamrock Rovers and Waterford scoreless at Brandywell. The last home match was uninspiring but nevertheless it was a 2-0 win over Bray and the last time City met Sligo, Peers was instrumental in keeping a clean sheet in a one-sided 2-0 win at the Showgrounds on his debut. So don’t expect a more pragmatic, defensive-minded approach tonight as Shiels’ troops bid to bounce back from last weekend’s disappointing loss. Peers puts that result down to the hectic schedule of league games in such a short space of time and the Candy Stripes thread-bare squad. “The games have come thick and fast and we’ve had to use the same 12 or 13 players over the course of maybe two months. So it’s just taken its toll on us really. It’s up to us to dig deep and pick up another three points at home. We did that against Bray. It wasn’t the prettiest performance but that’s what we have to do. It happened against Shamrock Rovers when we lost. We got a good beating and then we bounced back and went 10 or 11 unbeaten so let’s try do that again. “Waterford wasn’t the best of games but it was to do with the boys being tired more than anything. It’s been a hectic schedule. I know everyone is the same but we’ve been using the same players over the course of the last two months so it’s taken it’s toll. The robust defender certainly doesn’t come across as the sentimental type and he claims games against the club he spent 10 hugely successful seasons with is just like any other fixture. “It’s just another team. I’ll play the same way I’d play against anybody really. I just want to win the game and play well. I wouldn’t worry about who it was against. I just want to help the team as best I can.